Tehran, Iran, a city that many would call polluted, perhaps even say that you should better leave as soon as possible. And while the city might be polluted, and mainly consist of concrete, it is actually home to some of Iran’s most beautiful sights. From colorful palaces, to green parks and busy bazars, Iran is a city that can keep you busy for day. Wander around the endless alleys of the bazar, or go and explore some of the most beautiful viewpoints of the city. Tehran is a city that has a lot to offer, if you are willing to give it a chance. Ready to see what this mind blowing capital has to offer for you? 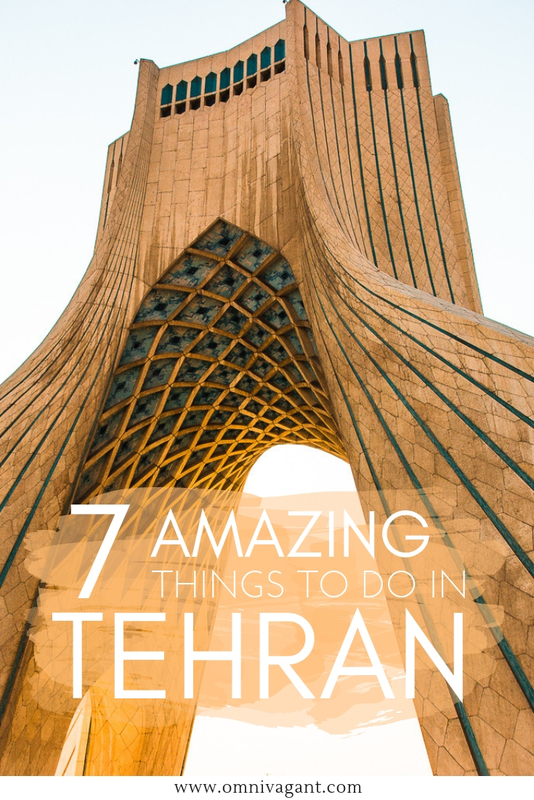 Read here about the 7 amazing things to do in Tehran! Tehran, the capital of Iran, is located in Northern Iran. 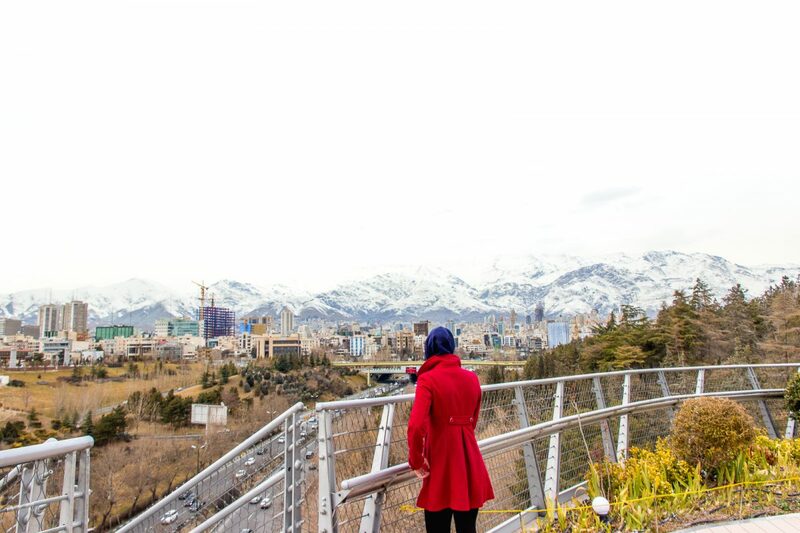 Tehran is surrounded by stunning mountains, that during winter times are snow topped, creating the most beautiful views from the city. Explore the hustle and bustle of the city or escape to the mountains for a skiing vacation, Tehran has it all. To give you a better idea of where Tehran is located, check out the map below. With the rise of tourism in Iran, there is also a rise of hostels available in Tehran. 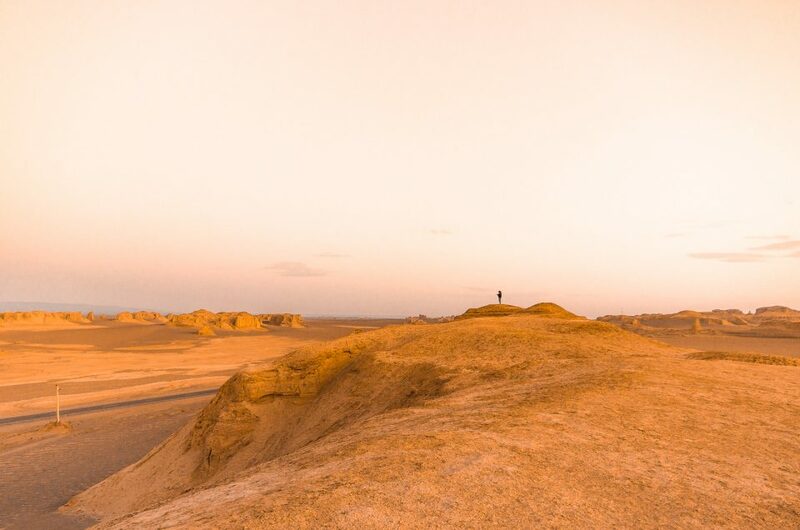 While 2 to 3 years ago there were only a handful of options available for travelers backpacking Iran on a budget, nowadays there is plenty of hostels and guesthouses to choose from. We have listed some of the most popular options below, and the best thing, nowadays you can all easily book them on Hostelworld. 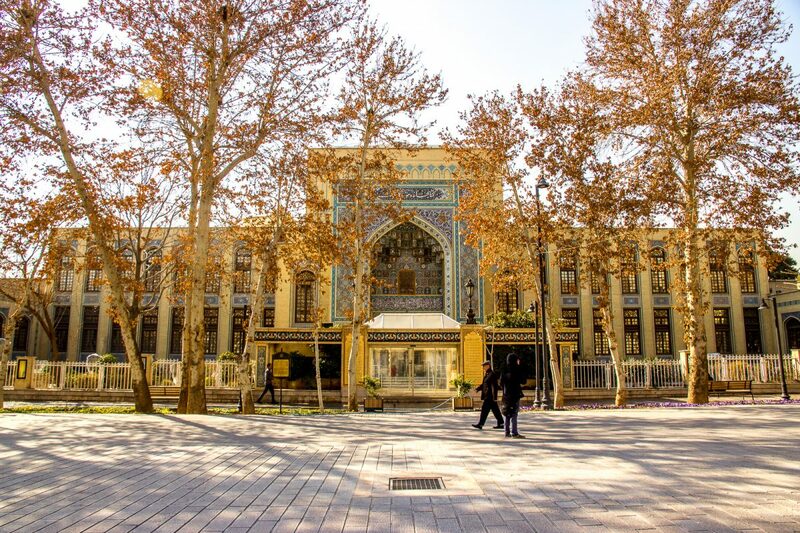 Tehran Heritage Hostel – Tehran Heritage hostel is a centrally located hostel with many sights within walking distance, or you can simply opt to take the metro that is located only 100m away from the hostel. This hostel offers a wide range of private rooms and dorms and has a free breakfast in the morning, perfect for backpackers on a budget. Check out the latest ratings and reviews here on Hostelworld! 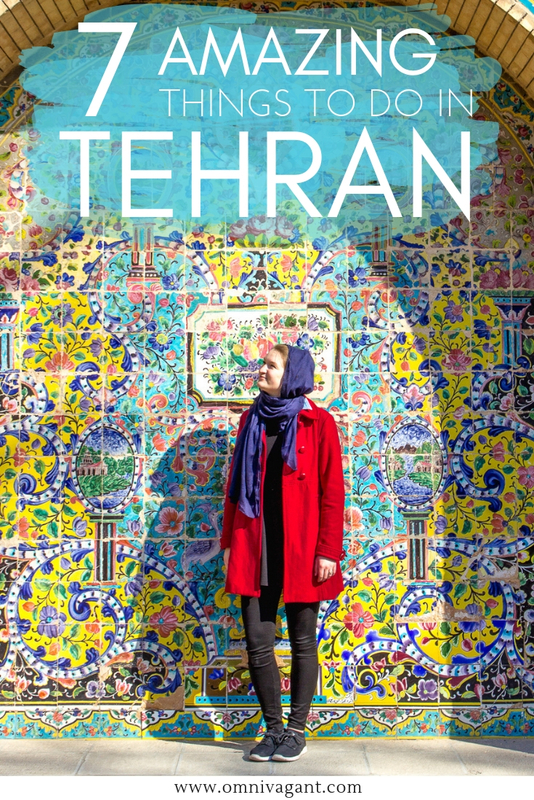 See You in Iran Hostel – Looking to learn more about Iranian culture, and to interact with the locals of Tehran? See You in Iran Hostel is the place for you. This hostel has a public cafe in their hostel where events are hosted and both travelers and locals have the opportunity to meet. 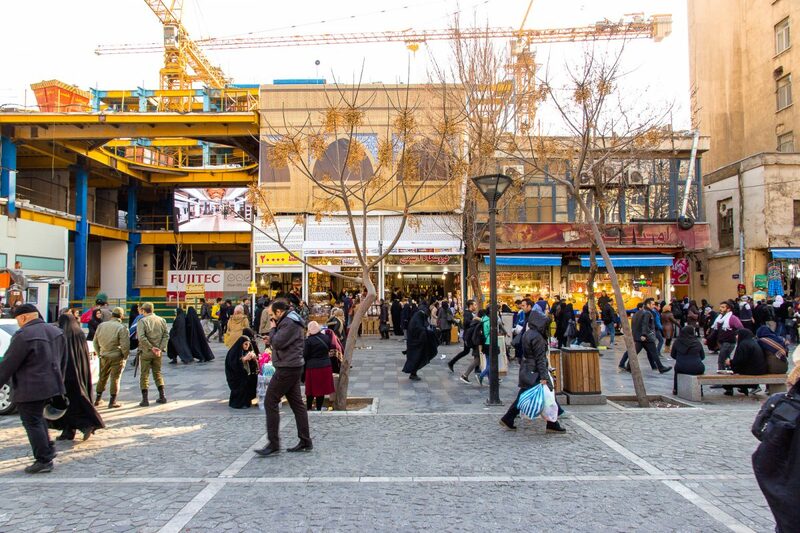 With a central location you can easily explore the nearby sights or take the metro to explore the rest of Tehran. See You in Iran Hostel has been one of the most popular choices of accommodation for travelers since they opened in 2017 and offers both private rooms and dorm rooms. Read about the facilities and the latest reviews here on Hostelworld! HI Tehran Hostel – Another popular choice for backpackers is HI Tehran Hostel, offering two locations within the city. HI Tehran hostel is a modern hostel offering both private rooms and dorms in a central location. Within 10 min from the hostel you will find yourself at a metro station, making it the perfect base to go and explore the city. Interested in staying at HI Tehran Hostel? Check photos, ratings and their facilities here on Hostelworld! Traveling beyond Tehran? 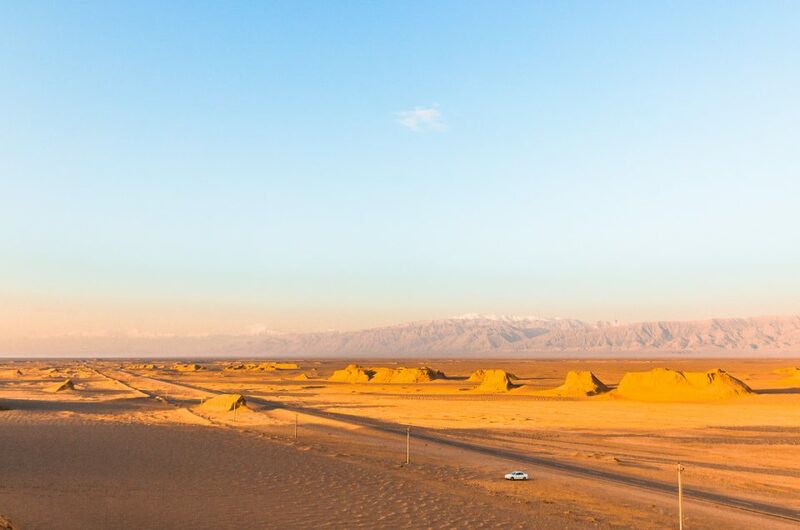 Check out our complete guide to accommodation in Iran here! In the centre of the city you can find the colorful Golestan Palace. While the entrance fee to this palace does not come cheap (up to 940000 IRR if all exhibitions are visited), it might be worth paying the entrance fee (150000 IRR) and the entrance fee to the main hall (150000 IRR). 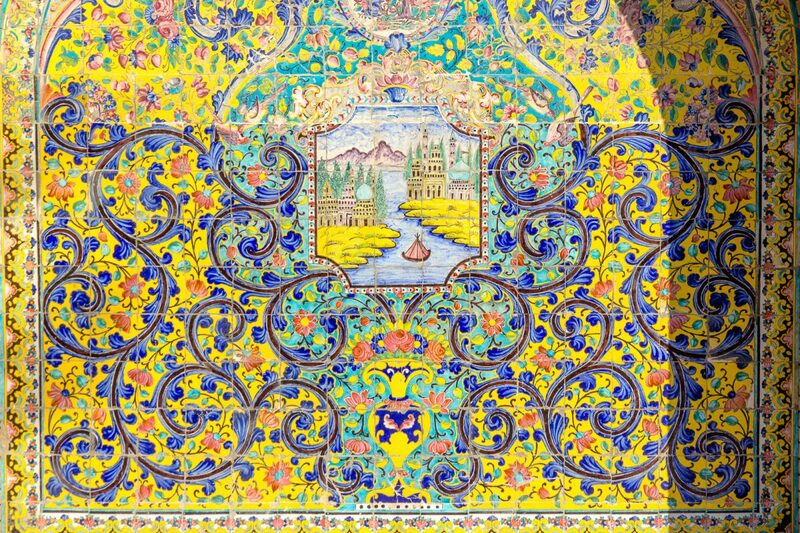 The garden of the palace is filled with extreme detailed and colorful tiled walls, which is unexpected to find in such a concrete jungle as Tehran! Take some time to walk around the garden and admire the mosaics from up closer, as every mosaic pattern is different. Then continue to admire the Golestan Palace from the inside, and be prepared to be amazed. Stunning architecture is awaiting you in Tehran, so be sure to add it to your Iran Bucket List! Loving Architecture? Be sure to visit the beautiful Nasir Al Mulk Mosque in Shiraz! 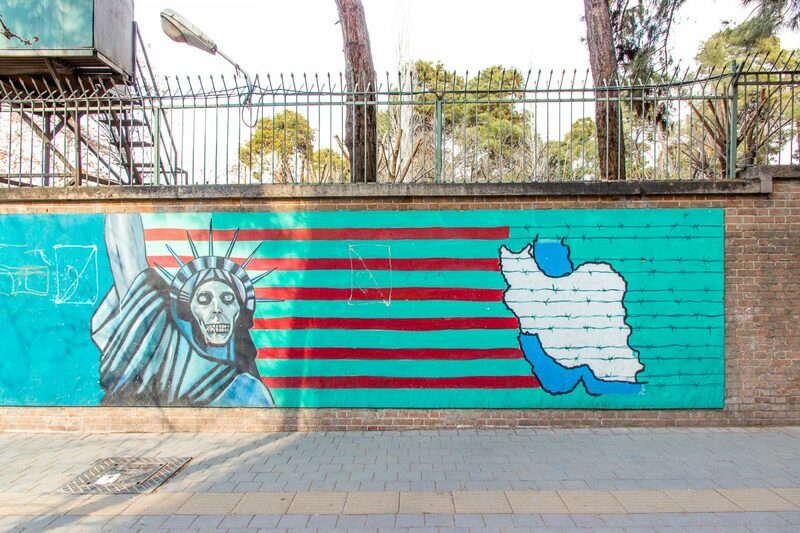 The US Den of Espionage is not hard to miss when you leave Taleghani metro station and walk straight into the words “Down With USA” written on the walls of what used the be the US Embassy. With the believe that the US was spying, students successfully invaded the US embassy in 1979, holding 52 diplomats hostage for 444 days. Nowadays, the second floor, where the evidence of espionage was found, is turned into a museum. In February 2017 I had the luck that the museum was opened, we were told, however, that the museum might close again soon. It is worth the metro ride to see the murals painted on the former embassy, and if you have the luck that the museum is open, I would definitely recommend paying a visit. Visiting the US Den of Espionage was probably one of my favorite and most interesting things to do in Tehran! An important part of traveling, at least to me, is learning about local culture so as such: do as the locals do, and an important part of that in Tehran is drinking coffee in a cafe. You will find many cafes in Tehran, especially around Enghelab where a lot of the students go. Especially on Fridays, which means weekend in Iran, the cafes will be packed. So if you found yourself having a bit of time, or finding it slightly chilly outside, go and enjoy some delicious coffee to warm up. Be sure to enjoy some delicious pastry with your coffee, you won’t regret it! Not a big coffee fan? Don’t worry, drinking tea is a big part of Iran, and you will be able to find tea at almost any cafe or restaurant. If you don’t get the chance to enjoy some coffee or tea, don’t forget to indulge in the local delicacies of Iran. From pastries to the most delicious meals, traveling Iran will mean a full stomach! Enjoy the delicious kebabs, falafel sandwiches, fesenjoon, gormeh sabzi, tahdig or abgoost. I still dream about these dishes months after leaving the country, and can’t wait to indulge in some delicious Iranian food again! A monument located on the west side of the city that truly is a symbol for the city of Tehran. While it is not located in the city centre, it is worth checking it out on a clear and sunny day! You can enter the tower and take an elevator to almost the top of the building, giving you an amazing view over the city, and if you are lucky, over the mountains. Be sure to walk around the tower as the architecture is quite stunning, unique and amazing. The best time to visit the tower would be around sunset, as the golden hour will create a perfect glow on the tower. After sunset, the tower will be lit up, allowing you to see it in a completely new perspective. Azadi tower can easily be reached by taking the metro. While this might not be the “must thing” to do in Tehran, it is still very much worth while your time. You can easily access the bridge by taking a metro, take a stroll through the park, walk across the bridge and admire the other parks. The bridge has an amazing view over the mountains, especially when they are covered with snow and there is a clear sky. 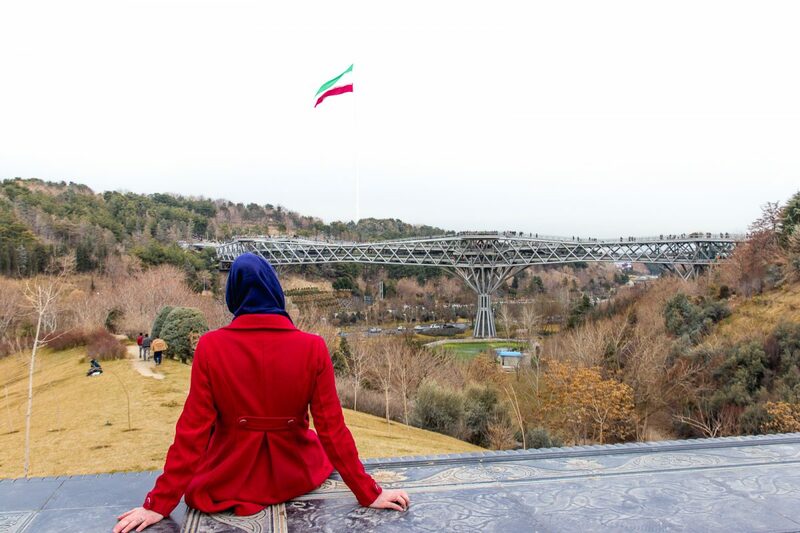 If you visit the Tabiat Bridge on a Friday you will find the parks filled with families barbecuing, and the bridges full with many of Tehran’s citizens. It is a popular hang out spot both on the weekend and during any other days, with some of the best viewpoints of Tehran. Enjoying viewpoints? Read about the most unique viewpoint in Iran at the Shah Mosque in Isfahan! Iran and their famous carpets, you will literally find them at every bazar… and let’s be real, they are quite stunning and of the most amazing quality. If you are interested in learning more about the carpets and the history of Persian carpets then you can visit the museum to learn more about the carpets and see the development of carpets over the years. They also display where the carpets are from which will allow you to actually understand this famous carpet business and the difference between the carpets a little bit better; a true recommendation in my opinion. What is visiting Tehran without actually visiting the Great Bazar? 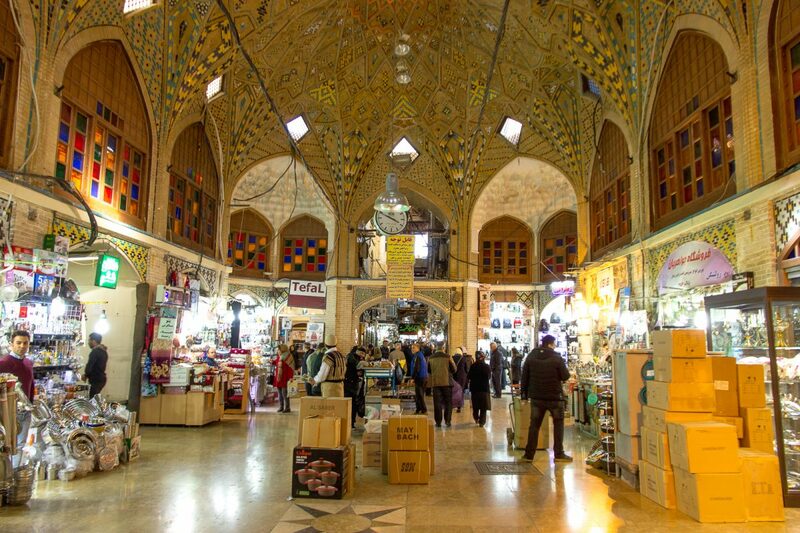 Be sure to take your time here, the bazar, like in most of Iran’s cities, are absolutely massive. And with little hallways left and right it is easy to get lost… The Bazar is separated into several districts, from clothing to kitchen utilities, to carpets to shoes, you will find (almost) everything here, although it might take you a while to find it. Wander around the never ending amount of small alleys, snack on some falafel and drink some fresh pomegranate juice while getting lost in the bazar. 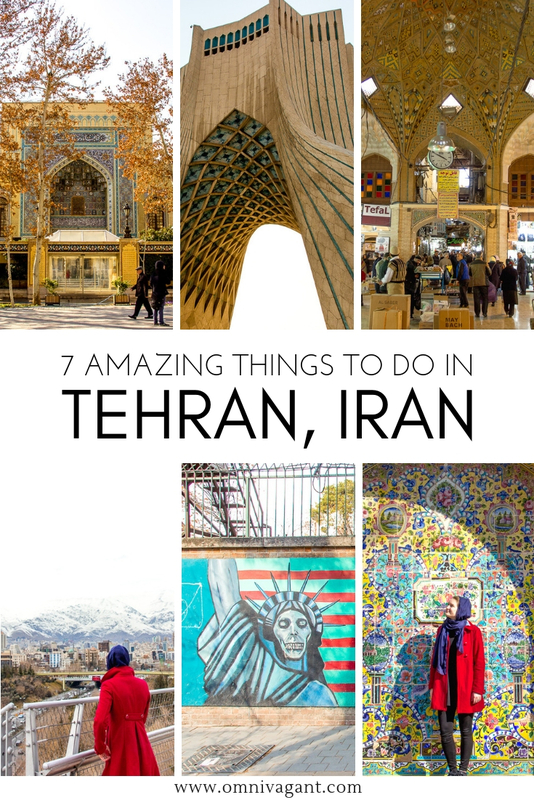 Last but definitely not least on the list of things to do in Tehran! 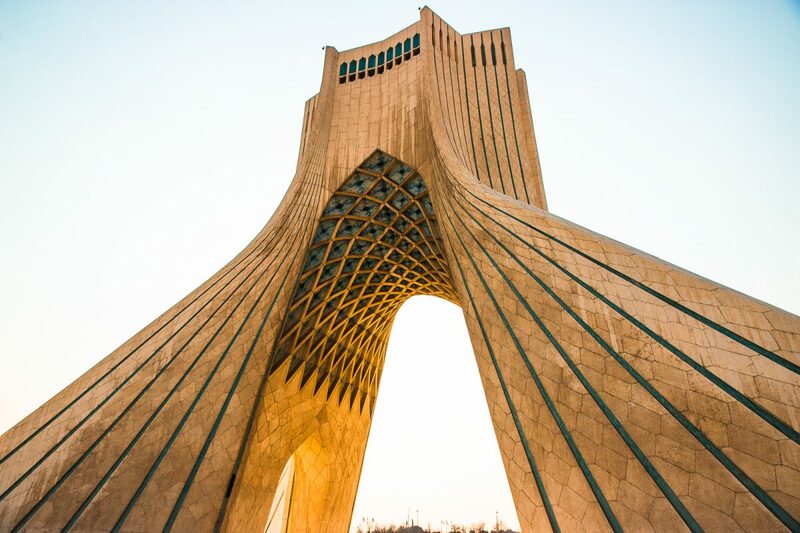 There you have it… 7 amazing things to do in Tehran. Yes, visiting Tehran might not immediately cross your mind when thinking about booking your next trip; I, however, couldn’t recommend it more. Tehran, while polluted and busy, stole my heart and I cannot wait to go back. Planning on traveling Iran? 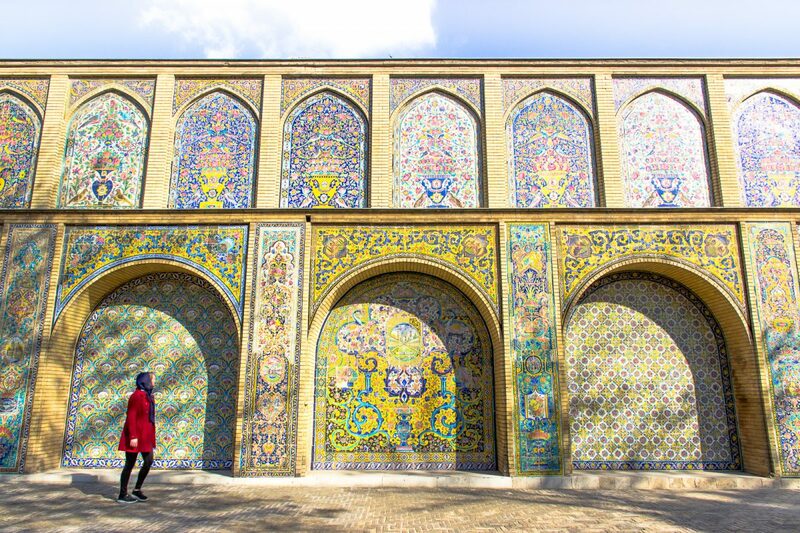 Be sure to check out some more of our city guides to create your ultimate Iran itinerary! 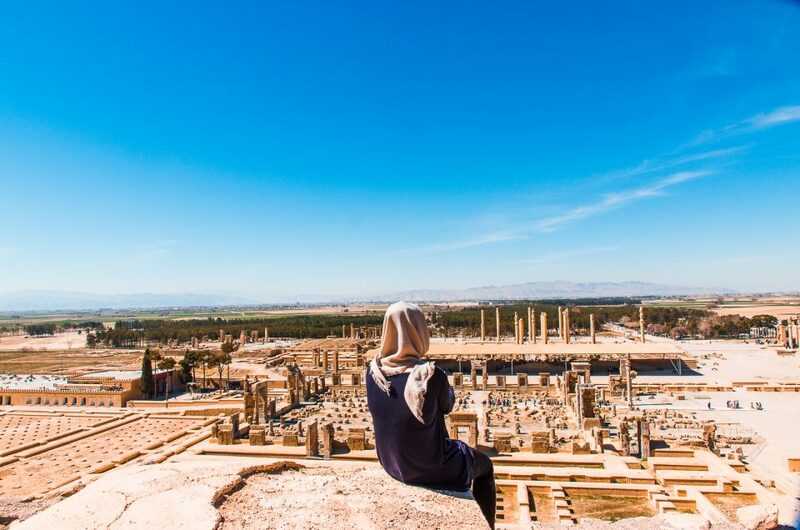 On top of all those useful city guides, perhaps you would also like to check out our complete Iran Travel Guide with everything you need to know about traveling Iran. 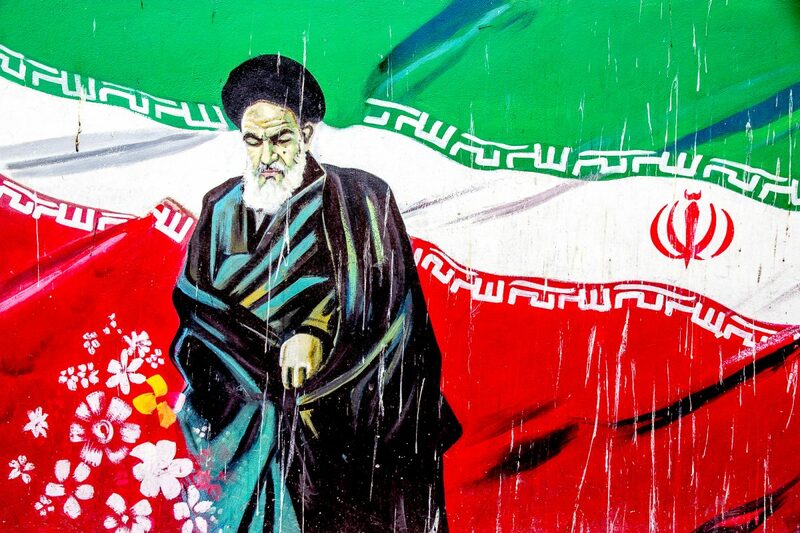 Have you been to Tehran, any other thing to do in Tehran that we have missed on this list? Tell us in the comments below and we’ll be sure to put it on my bucket list for next time! Oh, and don’t forget to pin it! Great post, lovely photos! I totally agree that learning about the local culture enhances one’s travel experience 🙂 Meeting locals is one of my favorite aspects of traveling! Thanks Lisa! Same for me! Saving this because I hope to visit Iran one day!